To use, you need to apply the cream around the eyes, around the lips and also on the lips if needed. The Organic Pharmacy say to use a small amount, but as the cream is so thick, this is one of those products that you will find yourself using more of at a time rather than a really small amount of. It spreads across the skin easily, but as it melts you will need enough to cover the area sufficiently. This is where the review brings me to discuss the only real downside to this product: it can take a while to absorb. After application it can leave the area around your eyes in particular looking greasy whilst the cream absorbs into the skin. Once it has though, it doesn't cause any problems with applying makeup on top. Around my lips I have expression lines. I'm a smiley person naturally, so I've had these small lines next to my lips for as far back as I can remember. However, after using this cream for just a couple of weeks they were pretty much non-existent. Now that I've been using this cream for a few months, I've forgotten what they looked like before. As a lip balm I also find it gives a great shot of moisture, which really helps if you have severely dry lips. Around the eyes, the first thing that I started to notice was how the dark circles and puffiness were quickly less noticeable. My eyes look far more awake, even when I'm beyond tired. The longer that I've been using it, the better the results have been. So why do I love it so much? Well, I've tried a whole range of eye creams. Some have been great, some not so great. Some have caused irritation to my sensitive eyes, particularly more natural or organic ones. This one though is super soothing. There is no irritation whatsoever, and on top of that it does an amazing job. In regards to results, this eye cream has been one of the fastest I've ever used when it comes to standing up to its claims, and it is one of the only ones that ticks all of the boxes that it promises to. The fact that it is also a lip cream in addition to being an eye cream as well makes it a great multitasker, and let's admit it, we all know by now that I love my multitasking products. So yes, if you are looking for either a new eye or lip cream, I cannot recommend enough that you give this one a try. I already have a whole bunch stashed away, ready for the day that I eventually finish this first tube. It definitely has Holy Grail status within my beauty collection, it is an A*, 10/10 product for me for sure. You can purchase The Organic Pharmacy Lip and Eye Cream from Feel Unique. 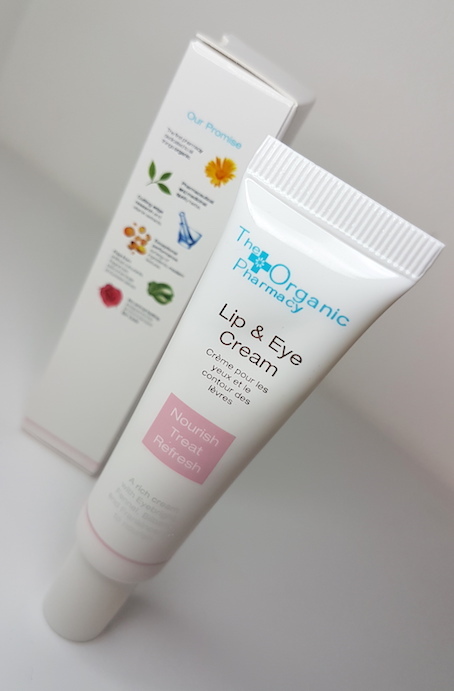 What are your thoughts on The Organic Pharmacy Lip and Eye Cream? What is your favourite eye or lip product?